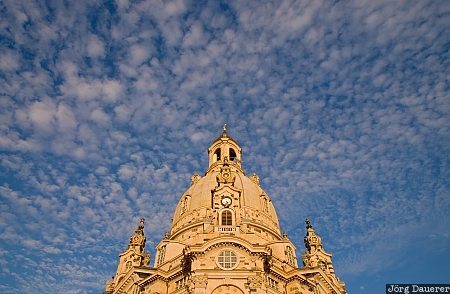 The impressive cupola of Frauenkirche in Dresden below a blue sky with puffy white clouds. Dresden is the capital of Saxony in the east of Germany. This photo was taken in the afternoon of a sunny day in October of 2010. This photo is part of the exhibition White Clouds (February 2012). This photo was taken with a digital camera.